These chicken sesame noodles are so simple for children to put together. They make a great snack or even a nice change for a lunch box. They will keep for around two days in an air-tight container in the fridge. Try adding different vegetable combinations, and if your children are really adventurous try adding some chilli flakes for a little kick! Follow a recipe; follow food safety & hygiene rules; tidy away; use measuring spoons and cups; chop using bridge/claw safely; use a vegetable peeler safely, use a box grater safely; use the hob (with adult supervision). Large lidded saucepan, chopping board, two forks, medium saucepan, medium bowl, metal spoon, measuring spoons, vegetable peeler, box grater, knife, chopping board, serving bowls. Poach the chicken breast in water/chicken stock. Place the chicken in a saucepan and cover with the water/stock by around an inch. Bring the water to a boil, reduce to a simmer and cover with a lid. Simmer for around 12-14 minutes. The chicken is cooked when it is opaque through the middle. Remove the chicken from the poaching liquid and shred on a chopping board with two forks. Put aside shredded chicken to cool. Boil the noodles according to packet instructions until al dente. In a medium bowl, mix together the vinegar, soy, sesame oil and honey. Drain the noodles and mix while warm with the sauce. Leave it to cool slightly. Grate the carrot and dice the red pepper. Add the vegetables to the cooled noodles along with the chicken and sesame seeds. Mix well. Chicken is an excellent source of protein and B vitamins as well as a range of minerals (e.g. iron). The skin is high in fat so it’s best to remove it before eating. 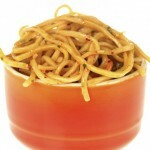 Egg noodles are low in fat and provide us with carbohydrate and some protein from the eggs. 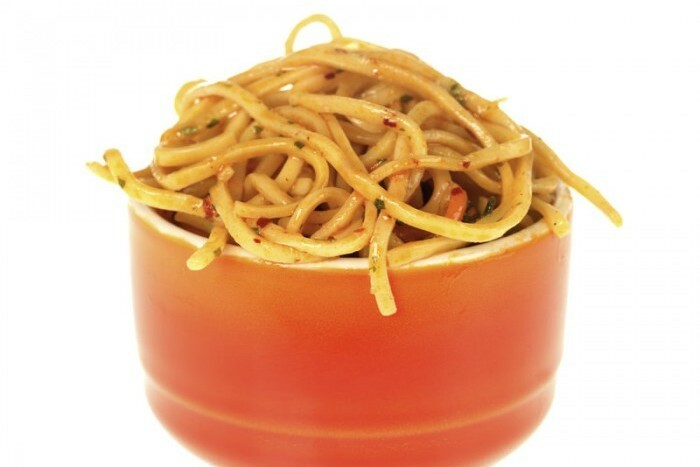 Beware instant packet-type noodles which are very high in salt.